West Coast and Collingwood will fight it out for premiership glory on Saturday afternoon. It all comes down to this – that magical one day in September at the MCG. Hatch’s Michael Thompson and Jesse Robertson preview Saturday’s AFL Grand Final – and deliver their tips on who will emerge as the 2018 premiers. 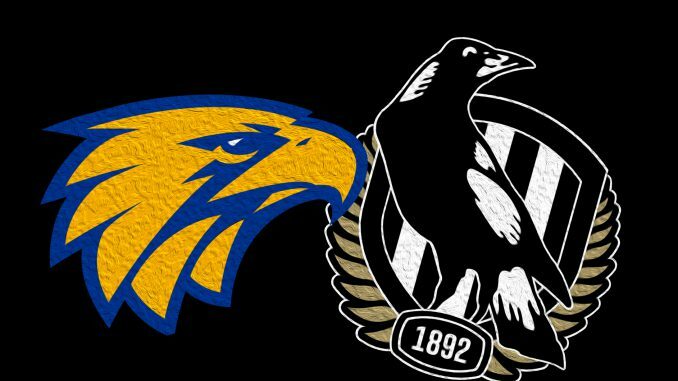 Collingwood and the West Coast Eagles will do battle on the MCG on Saturday in the first meeting between the two sides in the AFL’s showpiece season finale. For both sides, a piece of history is on the line – the Eagles are looking to break a 12-year premiership drought, much like they did when they defeated Sydney to win their last premiership in 2006 – while for the Magpies, a record-equalling 16th premiership is on the horizon should they come out on top. The two sides have met twice this year, with West Coast taking siren honours both times. In Round 17, the Eagles recorded a strong 35-point victory at the MCG, despite the loss of star ruckman Nic Naitanui, while the second meeting also went the Eagles’ way by 16 points in their qualifying final meeting. Both teams have pushed through injury and suspension trauma, an impressive effort in itself. For the Eagles, not only did they lose Naitanui in the clash at the MCG, but they have lost star wingman Andrew Gaff and defender Brad Sheppard in the lead-up to the Grand Final. For the Pies, Darcy Moore, Lynden Dunn, Matthew Scharenberg, Sam Murray and Ben Reid have been sidelined for large periods this season. How can Collingwood contain the West Coast forward line on a big ground? Coach Nathan Buckley’s main gripe throughout 2018 has been Collingwood’s defensive injury woes. But the Pies have battled on, and despite fielding a make-shift defensive line at times they have conceded a frugal 75.4 points per game. However, the challenge of containing the West Coast forward line – made up of hulking key forwards like Jack Darling and Josh Kennedy, and small, nippy speedsters like Liam Ryan, Mark LeCras and Willie Rioli – is a big test for the Magpies. In the qualifying final, Tyson Goldsack – in his return from a serious knee injury – was the man charged with stopping Josh Kennedy. Goldsack is expected to take Kennedy again, unless the Pies spring a shock and bring Moore in for his first game since injuring his hamstring against the Swans in Round 20. It appears Brayden Maynard will get the role on Willie Rioli after a number of spectacular shut-down roles during the finals series, while high-flyers Jeremy Howe and Liam Ryan could potentially play on each other. Is the midfield battle as decisive as in previous grand finals? The midfield battle is crucial. On paper, you would go with Collingwood’s star-studded midfield, which includes 2010 Norm Smith Medallist Scott Pendlebury, Adam Treloar, Steele Sidebottom (runner-up in this year’s Brownlow Medal), Taylor Adams and running wingman Tom Phillips. In recent weeks, the likes of James Aish and Brayden Sier have complimented Collingwood’s midfield line-up, allowing players such as Jordan De Goey and Josh Thomas to play closer to goal, where they have excelled in 2018. However, West Coast’s midfield is no pushover, perhaps best illustrated by their stellar first-half performance against Melbourne in last week’s preliminary final. With Gaff’s suspension affecting them, it has allowed the likes of Jack Redden to shine after a long stint in the doldrums, while Elliot Yeo has completed his transition from a half-back flanker to elite midfielder. Likewise, Luke Shuey has again performed in 2018, and Mark Hutchings will likely take a tagging role on Sidebottom. The ruck battle is crucial. Collingwood’s Brodie Grundy has been one of the standout ruck men in 2018 and is touted as a Norm Smith Medal prospect given his stellar work this season. Quelling his influence will be a big agenda for West Coast coach Adam Simpson. How much attention will West Coast pay to Steele Sidebottom? You can’t overestimate the influence of this year’s Brownlow runner-up in the midfield. Having played all 25 games in 2018 and averaging 30 disposals, five marks and almost four clearances in each, it’s no surprise both he and Grundy are heralded as key to Collingwood’s chances of securing their second premiership of the decade. Can Mason Cox string two good games together? The charismatic American became an instant cult hero after his one-man destruction of the Tigers defence in the second quarter of last week’s preliminary final, kicking all three of his goals in that time. But his stats for the year are below-average for a key forward in a well-performing side. This would be the perfect time to back up last week’s huge effort. How much of a factor will home advantage be? There’s been discussion throughout the build-up to this clash about the MCG’s license to host the Grand Final, a deal locked in through to 2057. Some have suggested the AFL move to the system used by other sports, where the final is hosted by whichever team qualifies higher on the day, irrespective of what capacity that ground may hold. Some have even floated the idea of a US-style ‘Best Of’ series to decide the premiership. While most Australians associate the Grand Final with a jam-packed sea of colours as 100,000 flock from around the country to the heart of Melbourne, it seems interstate fans and authorities alike might be keen for a change of structure around one of the biggest days on the national calendar. JESSE ROBERTSON’S PREDICTION: Ultimately, this is a clash of two sides who couldn’t be coming in hotter or more determined. Both won their preliminary finals in dominant displays, and Collingwood will be out for a measure of vengeance, having lost both prior clashes with the Eagles this season. The talls of the visitors should be too much to handle up forward, though, and West Coast should claim their fourth flag by 23 points. MICHAEL THOMPSON’S PREDICTION: This game could legitimately go either way, and it should only be a couple of goals in it come the final siren. I think it’ll be sweet 16 for Collingwood, who’ll take it out by 13 points.